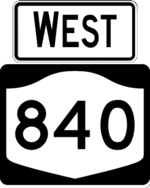 NY 840 is a short highway extending west of Utica. Opened in 2005, it is mostly a freeway and is known as the Judd Road Extension as it connects to Judd Road (signed as CR 840, but internally CR 40). 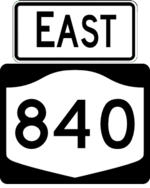 Long range plans exist to extend the road to the interchange of NY 49 and NY 365 in Rome.